Having a way with words is a key trait that companies want their employees to possess, as the value of excellent communication skills can't be overstated enough in the workplace. So as you look for top reporter jobs to apply to, make sure your resume is as thorough and clean as the stories you write. 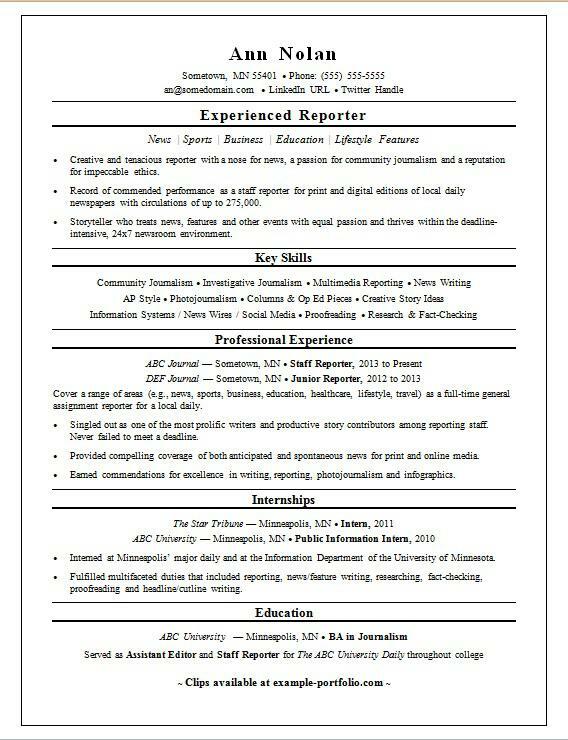 For inspiration, view the sample resume for a reporter below, and download the reporter resume template in Word. According to the Bureau of Labor Statistics (BLS), you'll find the highest level of employment for this job in the following states: New York, California, Florida, Texas, and the District of Columbia; and in the following metropolitan areas: New York City, Washington D.C., Los Angeles, Chicago, and Boston. As a journalist, you can expect to earn a median wage of $40,910 per year, or $19.67 per hour, according to the BLS. Additionally, you can learn more about media careers and editorial careers on Monster, as well as look for reporter jobs on Monster. Creative and tenacious reporter with a nose for news, a passion for community journalism and a reputation for impeccable ethics. Record of commended performance as a staff reporter for print and digital editions of local daily newspapers with circulations of up to 275,000. Storyteller who treats news, features and other events with equal passion and thrives within the deadline-intensive, 24x7 newsroom environment. Cover a range of areas (e.g., news, sports, business, education, healthcare, lifestyle, travel) as a full-time general assignment reporter for a local daily. Singled out as one of the most prolific writers and productive story contributors among reporting staff. Never failed to meet a deadline. Provided compelling coverage of both anticipated and spontaneous news for print and online media. Earned commendations for excellence in writing, reporting, photojournalism and infographics. Interned at Minneapolis’ major daily and at the Information Department of the University of Minnesota. Fulfilled multifaceted duties that included reporting, news/feature writing, researching, fact-checking, proofreading and headline/cutline writing. As a reporter, you wouldn't file a story without first fact-checking and copyediting it. Well, just as editors expect to see clean copy, so do hiring managers expect to see resumes that demonstrate your command of copy—without any weak spots or errors. Could your resume benefit from a line edit? Get a free resume evaluation today from the experts at Monster's Resume Writing Service. You'll get detailed feedback in two business days, including a review of your resume's appearance and content, and a prediction of a recruiter's first impression. It's a quick and easy way Monster's experts can help you put your best professional foot forward.